You know how I value me-time. In fact, I stand firm that it is the most unselfish act you can perform. When you take care of yourself and treat yourself to a special time that is just for you, to relax, recharge, or just buy a pair of pointy-toed fuchsia shoes without comments, you are actually doing the world a favor. You are making sure that you cultivate the most good-natured, thoughtful, and sane version of yourself to interact with other humans. Really now, who can fault you for that? And any me-time, should also have me-food. French toast, Nutella, pancakes, cream sauces, chocolate, bone marrow, fancy-pants food in tiny but painfully pretty portions, a bowl of truffle mac n cheese as big as my head, bacon/egg/mayo sandwiches. Yes, peas! For the most part, at least among those I see often, I am alone in my pea-love. But I don’t let that hamper my passion. I simply enjoy them on my own. – Cook the orzo in salted boiling water as per package directions. About 5-7 minutes before the orzo is done, chuck the peas into the pot. When orzo is done and peas are soft drain in a colander. – While the orzo and peas are cooking, heat a skillet over medium high heat. Add a scant amount of olive oil to the hot pan, swirl, and lay your bacon in. Cook bacon until almost crisp. Drain excess oil from pan (save those bacon drippings!) but leave some (about a teaspoon full…maybe a bit more, I won’t tell) in the pan. – Add the orzo and peas to the hot pan with the bacon. Toss a few time and transfer to a bowl. Add the mint leaves to the warm orzo/peas/bacon and toss again. Top with a generous grating of pecorino. Enjoy! Peas and bacon are a match made in the heaven I believe exists (along with hot showers + cold sheets, okra + shrimp paste, and good books + pajama naps). For me there is really something special about the pairing of smoky/fatty pork and green veggies. They complement each other perfectly in taste and balance each others’ intentions. And orzo, oh orzo, a pasta that looks like rice…I’m sold! Make sure to keep some extra pecorino on the side because you may just need an extra dusting when you’re at the middle of your bowl. When C saw the photo of this dish he sat up with surprise saying, “Where did that come from?”. “I made it for my lunch while you were at work.” “Is that special food?”, he says. “No, it’s just something I made for myself…it isn’t really your type right?”. Not one for false flattery, he looked at me and said, “Not really” with a sheepish smile. Afterwards though, I realized, it is special food…it’s mine. And if you’re a pea lover, it can be yours too 🙂 Happy weekend! I love orzo. That dish loooks really appetizing! Half a packet of orzo in the larder that needs using up – YAY!! Me food is the best!! And there are times when you must cook only for yourself, I agree completely. Hi Rosa! Love orzo too! That would make the perfect picnic pasta! thanks for popping by. It's good to hear from you. Biscottis are so nice… U should try them! How can you not love peas?? I love them, they are sooo versatile and tasty. This dish is my case in point, as it looks lovely with that bright green… Special indeed! Hi Stella! Good to hear from you as well 🙂 The biscotti look fantastic! LOVED your list of me-foods! And the fact that you included bone marrow. Hahaha! OMG, you just gave me one more thing to fixate on today… Truffle mac and cheese! And yes, in a bowl as big as my big head! Hahaha! Seriously, Joey, my stomach just growled! I'm not kidding. Oh, and lastly, I'm a pea lover too! Hi Arlu! I love bone marrow 🙂 Me-foods rock…and we deserve them too 😉 YAY! Another pea lover! They are yummy…I don’t understand why so many people don’t like them! 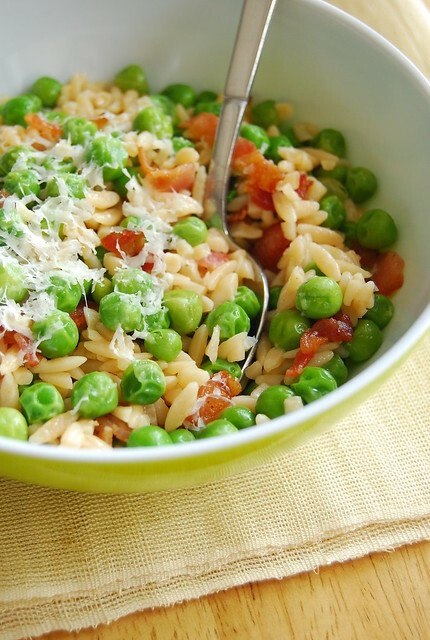 i love bacon, peas & orzo! must give this a try!! Hi Kristina! Hope you enjoy it! I found this recipe on Pinterest – my first time seeing it – I should have seen this a million times, it's genius! I'll help spread the love. I could eat peas every day. Made this last night as a side to our Venison steak. It was awesome ! I think next time I may saute some leeks also to go in the recipe. When I taste tested it I thought it needed something, I added a sprinkle of onion powder to it. I did not have Pecorino or mint so maybe that is why I thought it needed something. I live 30 miles fromt he nearest store so just did without those two items. Could not find the cheese listed so used pepper jack and no mint, and loved it. Tried with Mozz. but it was too heavy for the dish. next time will make enough for the husband also. Soooooo yummy. Used shredded parmesan instead and was delicious. Skeptical of the mint at first, but it works beautifully! Are the measurements for this recipe for a single serving, or multiple?